The following graph says it all. 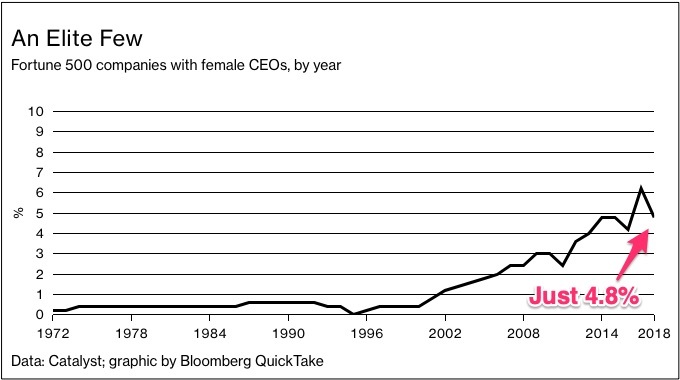 Not only is the percent of female CEOs plunging but the graph is a bit misleading. Do note that the scale just goes to 10%. Using countrywide data from Sweden, researchers tried to explain why the numbers have remained so low. The goal of the study was to compare the qualifications and families of women and men at the top. Using government statistics on 40,000 business, economics, and engineering graduates from 1990 to 2011, they considered 85 observable characteristics. The data covered academic achievement, networking skills, and family life. Women have the skills, the know-how, and the energy to be at the top. They also are better educated and more qualified than their male counterparts. Still, they were just 21% of all senior executives and 8% of all CEOs. Men earned, on average, 27% more than their female counterparts while those at the top made 7.1% more. Here we can ask why people who are more qualified achieve less. The answers start to surface five years after childbirth. Then the downward slide begins. At first, women devote fewer hours on the job. 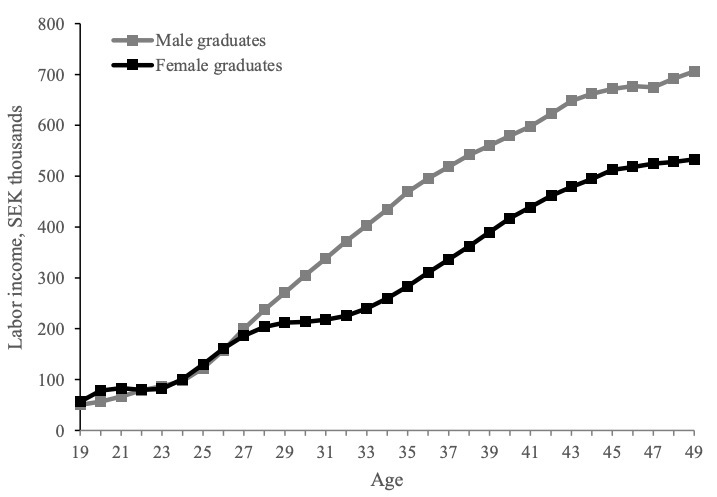 However, even after their children start school, the gap persists. The researchers emphasized that it was not caused by intelligence, time off, or network connections. Little that was measurable explained the disparity. There were just two clues. Having children was a turning point. Households ignored comparative advantage. Couples didn’t self-select the partner with more potential. The man was favored for his job. Crucially, the report suggested that their conclusions were relevant elsewhere. But, they also reminded us that Sweden is more egalitarian that many other countries. Being a mom does not detract from your cognitive ability, your ambition, or the job you do. But, for some mystery reason, it does block your ascent to the top. Here, as we have previously suggested, confirmation bias could indeed kick in. Because employers (men?) expect women to contribute less, they treat females as if they do. Consequently, a massive amount of human capital is wasted. A Credit Suisse analysis of 3400 companies agreed. It told us that diverse management was accompanied by a stronger bottom line. The return on equity, the dividends, and the market values of companies with diverse management exceeded those that were less diverse. My sources and more: HBS had a good summary of a recent paper on female CEOs. From there, I discovered and recommend this recent version of their study. Then, for the ideal complement, this Bloomberg article had the statistics from Catalyst and some analysis.